Going bibless – Why should you? There are many different types of lures available to shore based, saltwater spin fishermen. In New Zealand, metal spinners and bibbed lures are by far the most commonly used. Blade spinners (Mepps type) and weighted metal blades have historically been used in freshwater but they are steadily growing in popularity in the salt. Trout fishermen, in particular, find it easy to take their Mepps blade spinners for a swim in the sea, often with spectacular results. 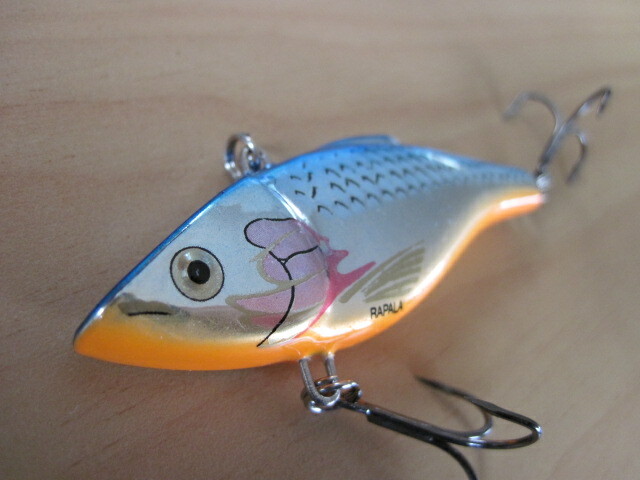 Kahawai, in particular, are frequently hooked on Mepps spinners. One lure type that is still as popular as an ugly sister in NZ is sinking bibless minnows. What are they and why is this? Bibless minnows are sinking lures that are shaped like a baitfish and do not possess a bib. A bibless lure is towed from a point on its back just behind the head. Generally the towing point is roughly a third to halfway from the head to the tail but this can vary. As the lure is retrieved water is forced across the leading face of lure and around the body shape which causes it to vibrate strongly giving the appearance that it is swimming through the water. 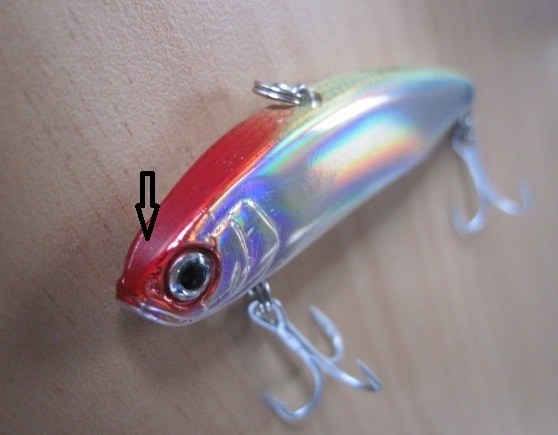 The arrow in the photograph highlights the leading face of the lure. Bibless lures often have deep bodies and flat sides so they displace a lot of water during the retrieve and it is this which creates sonic vibration. The strong lure vibration is readily transmitted through the water and these lures can be especially effective when water clarity is poor. This is because the vibration of the lure is picked up by the lateral line of predators and they rely on signals reaching the lateral line to help locate prey. The wider the face of the bibless lure the greater the water resistance and more pronounced action. Lures with rounded or thinner faces need to be worked more aggressively and retrieved more quickly to achieve a comparable action. Bibless lures are head weighted which means they generally adopt a “head down / tail up” position during the retrieve. These lures work best when jerked (or ripped) in short bursts through the water with the rod tip. A pause is introduced between successive jerks of the lure to imitate a baitfish in distress. Bibless lures tend to bounce along the bottom and predators are attracted to the “puffs” of sediment that are displaced every time the lure touches down. Bibless lures will also work if they are just retrieved steadily but it is worth introducing pauses or lifting the lure up and then allowing it to flutter back down to the bottom occasionally to see if this makes a difference to hook up rates. The simple answer as to why they are not used is lack of exposure. There is no doubt that they work. 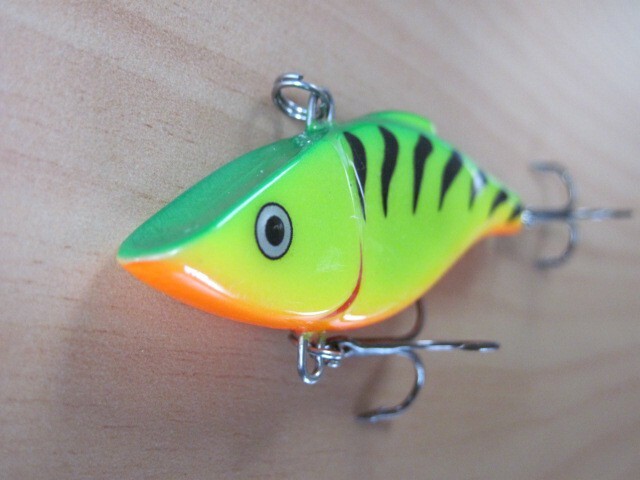 Many of the specialist lure shops are now starting to stock bibless lures, especially those used in Japan for targeting bass, as they have been found to catch a wide range of local species. I’ve been using Binsky blades (http://www.fishsenselures.com/index.htm) and Yo-Zuri S 3D Vibe bibless minnows for a long time now and they are deadly on a wide selection of fish species. How deadly? Is 32 kahawai in 36 casts deadly enough? One of the major benefits of a bibless lure is that it is working from the time that it lands in the water until it reaches the rod tip. It is important to keep the line tight to the lure at all times as it is not uncommon for predators to engulf this type of lure as soon as it hits the water and starts to flutter down through the water column. The broad flat sides of bibless lures are often coated in holographic foil or a vacuum deposited silver mirror like finish. 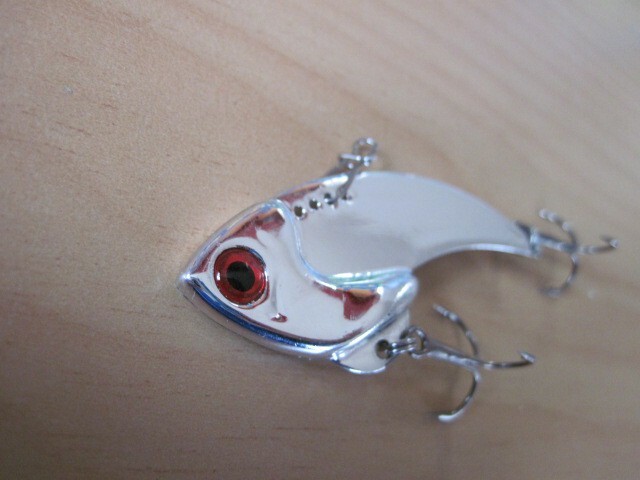 This makes the sides highly reflective and consequently the descending lure looks remarkably similar to an injured baitfish. Unlike a bibbed lure, bibless lures are less prone to snagging on the bottom. When the lure does snag it is often possible to flip the lure over the snag because the tow point is far enough away from the nose of the lure for it to act as a pivot point. As the nose digs in steady pressure often forces the tail to flip over the obstruction. As a rough rule of thumb the narrower the head of the lure the less likely it is to hang up on the bottom. I generally fish bibless lures with a main line of 7.5 kilogram fused braid and attach a 1-2 metre length of 7 kilogram clear Amnesia nylon monofilament trace to it with a 5 turn Surgeons knot. The lure is attached to the trace via a Lefty’s Loop knot. With this set up it is generally possible to free the lure from most of the underwater hazards encountered. So grab a handful and give them a go! Like all lures you’ll need to experiment to find a retrieve that is consistently successful. When you do find it though, success is virtually guaranteed.